Dazzlingly delightful and dizzyingly dexterous in La La Land, Emma Stone wowed audiences with her combined acting-dancing-singing abilities as Mia, an aspiring actor in L.A. given to thrilling outbursts of song and dance when love sparks fly between her and Sebastian (Ryan Gosling). For their incredible skills, Stone and Gosling will be the recipients of this year’s SBIFF Outstanding Performers of the Year Award. I spoke with Stone about La La Land, her character Mia, and what’s ahead. Congrats on the SBIFF Outstanding Performer of the Year Award and the recent SAG honor. How does it feel, and did you expect all this praise? Oh god, of course not. It’s so exciting for all of us to be part of something so special, and such an amazing thing to be part of a movie that people seem to be responding to in such a positive way. It’s pretty rare. None of this was an expected outcome by any means. The movie was so well-coordinated. What was the creation process like? Was it very collaborative? It was. Damien [Chazelle] was so open to collaboration from day one. It took me a while to really get emotionally onboard, so he was patient with that process and was listening to our ideas about character development and how it all would come together. He had such a vision on how to make this kind of thing cohesive. … It was so technical; it would have to be specific in so many ways and yet so natural, human, and alive in other ways. We were always trying to balance those two tones, and that was the most interesting thing to calibrate. Your character Mia endures a lot of rejection. Could you relate to that side of her, and how have you dealt with rejection? I relate to Mia in many, many ways. I had about three years of very similar auditioning experiences when I first moved to L.A. I was 15 and trying out as a high schooler, and there’s a huge life shift when you’re in your late twenties, from being a wide-eyed teenager who can’t even really conceptualize failure in that moment to someone like Mia. She lives with and sits with these feelings of failure on a daily basis; that feeling is very present for her. She has more maturity than I had at 15 . … It’s just sort of the ups and downs of an industry like this, or of just making creative projects. Some turn out, some don’t, some can be a bit soul-crushing to be creating, and there’s an ever-evolving relationship to things like rejection or failure. Both Birdman and La La Land are cinema about cinema. Is there a special appeal to you for these movies about movies? I definitely do see that. It’s definitely connected, but it didn’t feel that way to me at the time. With Birdman, I was drawn to working with Alejandro [Iñárritu] and sort of the darkness of that comedy and the ambition of that way of shooting it, and what was happening with my character in that movie. Then with Damien’s, the draws were pretty obvious. I hadn’t even associated that connection until I was already working on La La Land, and thought, “How interesting.” So it was totally different draws, and that’s kind of a happy accident. Where do you see room for artistic growth in the coming years? Where do you hope to head artistically? There’s so much room for growth — hopefully nothing but room for growth. I always want to be getting more conscious and letting more stuff go within me personally. I hope there’s nowhere to go but growing. It’s hard to know the specifics of what it is ultimately that I want to be doing forever, but that’s all I can really think about: getting more focused, working harder, and hopefully growing more as an actor and a human being. 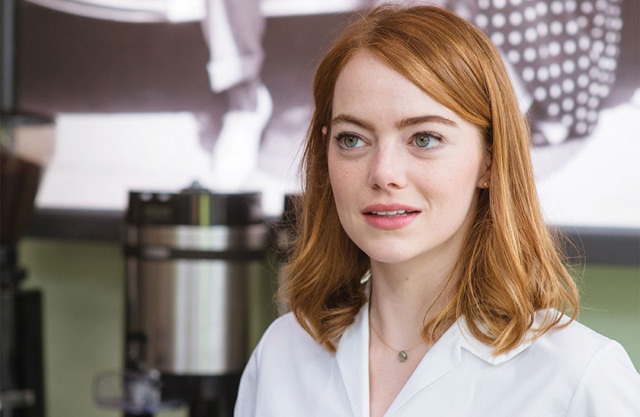 Emma Stone and Ryan Gosling will receive the Outstanding Performers of the Year Award on Friday, February 3, 8 p.m., at the Arlington Theatre (1317 State St.). See sbiff.org.